I wanted to do a few short blog posts about products that I really like and that work well. First up is a stud finder that I found. It’s called the Stud4Sure stud finder (not an affiliate link). It’s more accurate than fancy electronic studfinders and much more accurate than knocking on the wall. It costs 15 bucks, which is pretty cheap in my book. Highly recommended. Holy crap, $15 for an inch and a half of plastic with magnets inside? I see a good niche for a new DIY stud finder. I was excited to see this as I’ve just had a frustrating experience with the LED kind, but I’m confused–what if you’re at a section of the wall that doesn’t have nails in the studs? You say it as if all studs are filled with nails–most aren’t. In fact, nails are often the sign of electric junction boxes and other such things that you really want to avoid. Now you just need to invent a dog who can sniff spam when it appears on the screen, even through many layers of cloaking. Lol yeah !! david thinks that your blog was hacked and this post is fake ! I doubt !! u have something to say abt this ? Or use a fridge magnet for 50 cents? Beware of brass/copper nails and watertubes. You won’t find these with this magnet. $15? Are you kidding? That’s nothing. Most women would pay thousands for a “stud-4-sure finder”. I do a lot of DIY and finding studs is a pain the you-know-what, I never thought us using the Neodynium magnets I have lying around. At our house, we always just did the thump test. Knock on the wall with your knuckles, when you don’t have a hollow sound anymore, there’s the stud. Why did you feel it was necessary to disclose its “not an affiliate link”? Thats just weird. Who cares if it is? I am getting confused by people thinking that if money is involved honesty goes out the window, unless that is your personal policy. You are paid for your job are you less honest in your work? Harith, I think my webhost was just flaky for a couple hours; my blog wasn’t hacked or anything like that. (Pokes head around corner) Uhhhhhh I thought this was Matt Cutts site, and it seems to be Tool Time? LOL Sorry, wouldn’t you be looking for the nails used to put up the drywall, guys? Strange, English is my second language and I allways thought a stud was something else. So when I saw an article about a Stud4Sure finder I thought it was something for women…. Or you could just use an electric shaver. It will make a different noise if there’s on the other side of the wall. That is a pretty fancy trick for the stud finder and it’s a lot easier than a beeping one that works off of thickness. 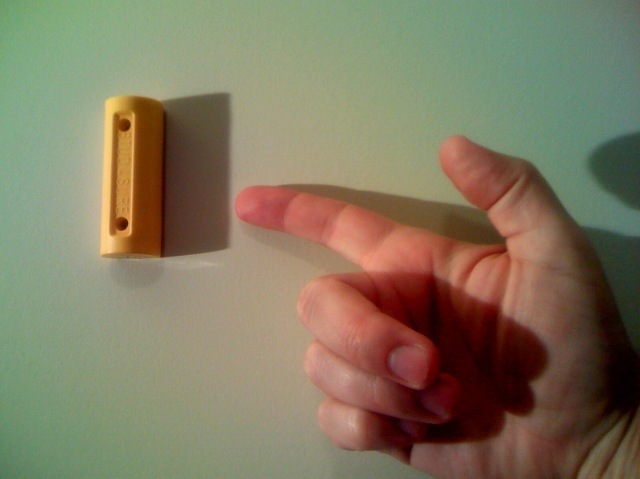 The only part about using magnets is old metal or vents in the wall. Other than that, the magnets are a solid stud finder. Great tip Matt! I have an inexpensive DIY alternative. I bought a variety of strong Neodymium magnets off eBay a couple of years ago. I use a one inch diameter model wrapped in an old washcloth as a nail finder. The washcloth keeps the magnet from marring the walls. The magnet cost about $2 and I have old washcloths lying around the house. It “stores” mostly out of sight stuck to a nail between a wall and door frame. I always know where it is! Standard studs are 16″ on center. Sometimes you’ll pick up a purling (horizontal brace). Once you find a nail, move the magnet vertically to find other nails to verify you’re on a stud. Make sure you know where electrical and water is located on both sides of the wall to avoid sparks and leaks. Yes, Wim, us poor women always have to bear the funny looks and snickers when we walk into the hardware store and ask for a “stud finder”. When I went to buy one, a very helpful employee volunteered to come to my house personally. I really only wanted to spend $15 on some plastic and magnets! So even Matt can’t get reliable hosting. That’s not comforting. Have I mentioned lately how much I love it when you do a post like this? I took part in this little video experiment with some folks you should know, and I was wondering what tidbit’s of advice you would add to the conversation? Can drilling into a buried junction box get you pregnant? I install commercial kitchens in restaruants. We install stainless steel wall paneling on the cookline walls, which makes it very hard to locate the studs after the paneling is up. A fellow installer had one of these stud finders, and I cannot beleive how well it works. Those magnets are so strong, it has no issues at all pulling tight, even through the paneling. Not only does it work through the stainless, but it will also find the screws through 1/4″ ceramic tile. I am a huge advocate of this stud finder. Sure, you can just buy a neodymium magnets and a rag for less money, but that would be like using pliers instead of a socket set. For the fifteen bucks, just splurge a little bit. I had one of those $20 electronic stud finders and it was total crap. So I went down to the local junk store and bought one of those super strong magnets for a couple bucks. Then I rubbed it lightly across the wall and when it found a nail it stuck fast. Real simple; real effective; real cheap. Everyone assumes that you will always be looking for studs under drywall, which may be the case in the majority of modern homes, but what happens when you are chasing studs under plaster, or several sheets of drywall or under ceramic tile ! Magnets will be of little use, especially if metal lath is used in the plaster ! In these cases You need Hi-Tech. I did something really wrong… I put in a junction box and covered it with drywall. Later I realized my mistake but can’t find the junction box. My Stanley beeping and flashing stud finder is no help: it flashes and beeps where there are no studs, etc. Any ideas on how I can find this junction box… (without cutting a lot of drywall)?